Easy to carry: Our UNIQUE 2 IN 1 TRAVEL LAP TRAY it's easy to carry since it's portable and serves just the right purpose. Our car seat tray will conveniently travel with you anywhere. DRIVE SAFELY WITH BUSY CHILDREN IN THE BACK: You can concentrate on your driving without having to hear constant bickering from your bored children. Stock the easy-to-reach side storage pockets with your kid's essentials for entertainment, crayons, markers, coloring books or toys and you are good to go. You can also use it on the plane, bus or even on a picnic. BACKSEAT ORGANIZER FOR MULTIPLE USE: With a clear view pocket large enough to t your important documents or tablet, it makes organizing your car so much simpler. Unzip the side walls and just attach it to the back of the driver's seat and turn your vehicle into a cinema on the go. The generous storage spaces allow you to have a clean and tidy car. REINFORCED BOARDS MATERIAL FOR LONGLASTING STABILITY AND COMFORT: The base board of our travel kit is double sided for double benets. With a bottom layer made of sturdier, durable, thick MDF to keep your board from unpleasant sagging over time and a top layer of softer foam to keep your child comfortable, the travel dining and playing table by OT Valley features long, adjustable straps and strong buckles for a quick setup. WATERPROOF FINISHING LAYER FOR EASY CLEAN-UP: The outer layer of the main board of the activity table is spill-proof material keeping it stain-free and easy to clean for germ-free use as a snack table. The unique, original artistic illustration provides a story base to use according to your creativity. Your imagination is the limit! QUALITY FAMILY TIME ON THE ROAD: Our digital guide will provide you with the golden rules of traveling with children to ensure an unforgettable, stress-free experience. Discover top holiday destinations to be explored with the whole family, strengthening the ties that bind you. Use our travel checklists to nish packing in no time, without worrying you may have forgotten something essential. 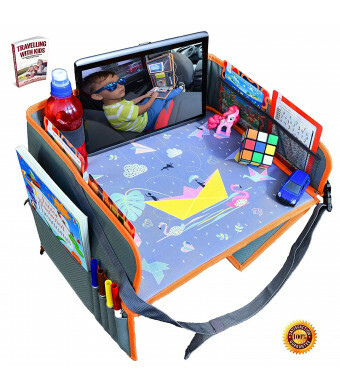 OT Valley gives you the Unique 2 in 1 Toddler Travel Tray that turns into a Car Backseat Organizer with Tablet Holder special made for your kids and your needs. Multipurpose: while our travel lap tray will perform the function of a dining table or writing and coloring arena, it also functions as a car backseat organizer with a tablet holder and pockets when side walls are unzipped. Your kid can be entertained with kid shows on the tablet while you get less worried. Useful Wherever You Go: you can prevent your kids from the regular fighting in the back seat; with the tablet seated in our backseat organizer tuned to your kids favorite show, you do not expect any fights. Your kids will be occupied and creative! The car seat lap tray for children by OT Valley features strong, durable boards and spacious lateral polyester pockets to keep your children's creative supplies and favourite snacks within reach for more entertaining rides. It ts most car seats, high chairs and strollers due to its adjustable straps and solid buckles. 1 x eBook Travelling with kids. Reasons parents should travel with kids"
We guarantee your 100% satisfaction for your new high quality travel tray! If you are not satisfied then we'll replace it for free or refund your money! 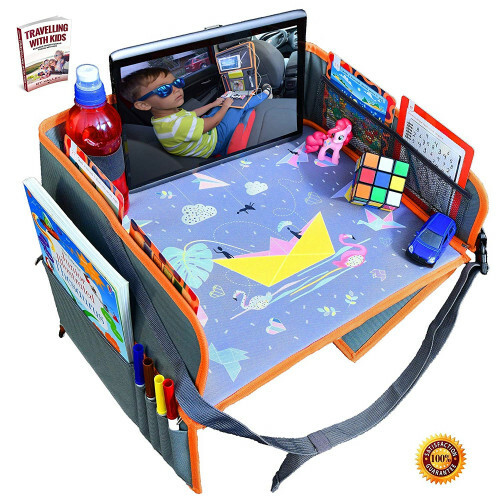 Add the kids travel lap tray to cart and start your amazing adventure!